With the Chanel Soho polishes being a limited release, and therefore, a little difficult to come by, many are wondering whether there are any dupes out there, especially at more reasonable prices. I have good news and I have bad news. I was able to find a dupe for Chanel Steel, but with a discontinued OPI. I found no duplicates in my stash for Chanel Strong. As you can see, Both OPI LLM and CG Jitterbug are far too silvery and have those large, flaky shimmer particles, and each are adequate substitutes for the other (i.e. unless you're a polish fiend, you don't need both). Zoya Freja is a little deeper, but still far too light. OPI Black Satin is right on the money. Thumb, pointer and ring finger, OPI Black Satin; Third and pinkie, Chanel Steel. As you can see, Black Satin is just a teeny bit lighter than Chanel Steel. In the bottle, they're nearly the exact same color (look above the Chanel label, as it places a blue cast on the polish). So, if you're lucky enough to own Black Satin (or run across it at a reasonable price) it is a suitable dupe for Chanel Steel. If not, the crazy evilBay prices for OPI Black Satin place it nearly at the same price as Chanel Steel, and given that the Chanel is opaque in two coats, while it takes the OPI at least three, the Chanel winds up being the better buy. Who'd've thunk it?! As I stated, I didn't find anything that would serve as an actual dupe for Chanel Strong. There is one that is close, but as the saying goes, "Close only counts in horseshoes and hand grenades". Well, at least if your a nail polish fanatic like I am. If not, close might be good enough for you. As you can see, OPI LPaM is much too purple, as is China Glaze Bogie (as well as being too light). Zoya Mikka is too plummy and also too light. OPI EftC is the one that is closest. It has that blackened base, but not quite as many shimmers as Chanel Strong. Also, the shimmers are more of a deep fuchsia and red-violet rather than red. Still, if you're looking to save cash and aren't too fussy about having the exact color, OPI Eiffel for this Color is a good substitute. Plus, it is still available for retail price (or cheaper at transdesign.com). Love your writing. And plum/grey nail polish? Just like with eyeshadows, I fall for them every.single.time! I think my OPI Black Satin might be slightly different than yours? I recall mine being a little lighter than Steel, and having some different color fine glitter that shows up under bright light. I will need to do a comparison. Thank you! 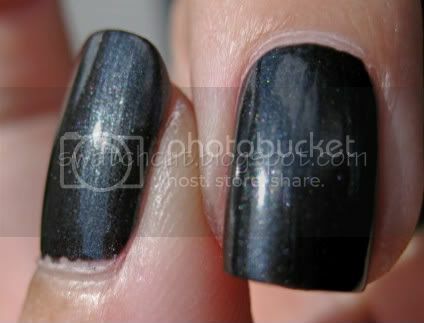 It is quite possible there are different versions of OPI Black Satin. OPI (annoyingly) does that. It did that with My Private Jet. The version of MPJ I own is the dark brown with holo glitter rather than the original black with holo glitter. Lots of swatch posts coming up!